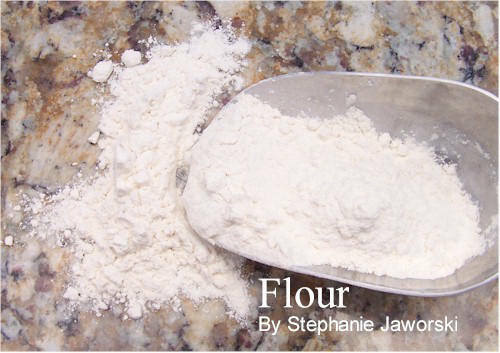 The term flour was once spelled 'flower'. The milled flour we buy and use today was once ground using a mortar and pestle. Milling of different grains dates back to prehistoric times and through the ages automation of the milling process was perfected. Most people think of flour in terms of "wheat" flour. When in fact flour can be ground from a variety of nuts and seeds. Some types of flours available are: barley, buckwheat, chickpea, corn, oats, potato, rice, rye, soy, wheat, and vegetables. When used in baking flour contributes body and structure, texture and flavor to baked goods. When used in baking it binds the ingredients together and supports the batter. It can also be used to thicken sauces, creams and pie fillings. Recipes calling for dusting cake pans or counters with flour help prevent batters and bread dough from sticking to surfaces. Flour can also be used to coat fruits and nuts before adding to batters, thus preventing them from sinking to the bottom of the pan when baked. Cake flour has a 6-8% protein content and is made from soft wheat flour. It is chlorinated to further break down the strength of the gluten and is smooth and velvety in texture. Good for making cakes (especially white cakes and biscuits) and cookies where a tender and delicate texture is desired. To substitute cake flour for all-purpose flour use 1 cup plus 2 tablespoons cake flour for every cup of all-purpose flour. Make your own - one cup sifted cake flour (100 grams) can be substituted with 3/4 cup (85 grams) sifted bleached all-purpose flour plus 2 tablespoons (15 grams) cornstarch. Store your flour in a cool dry well-ventilated place for up to six months. To prevent insects you can store flour in the refrigerator or freezer making sure the flour is defrosted before using.